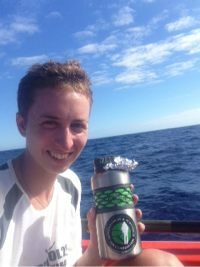 Posts from Elsa’s Pacific Solo Row, which she undertook in 2014. Pushing east, seat repair, turtle visit! My rowing shift was interrupted this evening by one of the wheels falling off my seat. Digging out my tools and spares kit, I set to work changing it over for a new one. While I was working on it I noticed another couple that looked rather worse for wear, so changed those as well. There was nearly an unfortunate incident as I scrambled out of my hatch, all the Allen keys I possess in one hand, just as the boat was knocked by an unexpected wave. Luckily I kept a tight grip on them… The last hour of rowing today was noticeably smoother, and I’m looking forward to testing it out again tomorrow. The little fish still crowd around the bottom of the boat, although no one seems to be eating them at the moment. Today also saw a return (or a friend?) of the turtle. He’s really keen on looking at my rudder up close, probably because there are a few barnacles on it, but maybe also because it moves back and forth independently of the rest of the boat? Saw some dolphins in the distance this evening. This group didn’t come too close to the boat, but it seems that early evening is the time for dolphin spotting out here. Support Elsa’s journey home and her fantastic charities – donate as many oar strokes as you wish at £0.10 each! 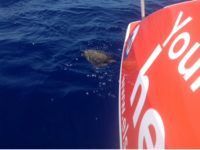 Day 39: Sampling, weather, dolphins and a turtle! Today I took one of my water samples for Adventurers and Scientists for Conservation. Each sample needs to be a full litre, and we have been given special bottles to use for sampling. As well as taking the sample itself and labelling it, I need to fill in a form with as much data as possible, including the wind speed and direction at the time of sampling. Once back on shore I will send off all the samples I’ve taken to be tested for microplastics (the tiny, insidious particles into which plastic pollution breaks down). I’ve been noticing that I’m either more sensitive to the weather out here than I usually am, or I’m just more aware of it because there are so few other influences/stimuli. Yesterday was a really close, brooding sort of day, overcast and hot. All day I had a bad headache. A little rain came along late afternoon, clearing the sky and the atmosphere, and with it my headache, leaving behind a fresh, brilliant evening of bright sunshine. Looking back through my log book last night, I noticed that this is the third time I’ve had a bad headache since I’ve been out here; each time the weather has been similar, and each time the headache has cleared with the freshening weather. Maybe it’s coincidence, but it doesn’t feel like it. – Yesterday evening after the sun came out I heard a splashing sound and looked around to see that I was being approached by about eight bottlenose dolphins. They came right up to Darien, and swam under and around us for quite a few minutes before continuing on their way. – Just as I was having my lunch today I saw something to Darien’s stern, very near the rudder. Looking closer, I saw it was a turtle! It hung around all through lunch, watching me and splashing about. Although I’ve seen turtles at sea before (when I’ve been diving), it seemed really unexpected and out of place today, hundreds of miles away from land and swimming about on the surface all alone. I said goodbye after lunch and we went our separate ways. Day 37: thanks, waves and guests! From Elsa, in the Pacific. Please see her statement about her change of destination if you haven’t read it yet. Wow – thank you so so so much to everyone who has sent messages of support following this change of direction. It means a huge amount that you are all still being supportive, and will really help with this push towards land. I really agonised over taking this decision, and although there are inevitably still questions and concerns. I feel so much lighter now that the decision is made. I’m strangely excited about the adventure of the unknown as I head towards a previously unplanned harbour, and can’t wait to see what the rest of the journey will bring. Over the weekend I had been secretly hoping that I’d get some nice rowing with the wind for a change, now that I’m headed in a easterly direction, but the Pacific continues to challenge me. We’ve had some really strange weather today. 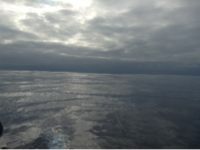 Following big winds and seas over the weekend, the wind had now lightened, but has also turned around, meaning that the seas are very confused. I’ve got big, rolling waves coming towards me on one side and on the other small choppy waves also coming towards me and meeting each other beneath me. I’m not sure which way to look to keep an eye on approaching waves! The good news is that I’m now managing to make progress in the right direction, even though it’s quite slow. Initially it felt strange to be celebrating, rather than mourning, eastward progress, but already it feels completely normal. 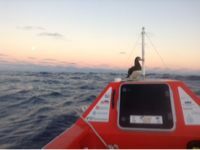 – A couple of nights ago, while I was sitting on para anchor, a bird I haven’t seen before came and landed on my bow cabin. It stayed overnight, hanging on with difficultly as the boat pitched and tossed, and leaving behind a lot of unwanted presents on my solar panels for me to clean up. It was black with a white stomach, and straight pointed beak. Can anyone identify? I’d love to know more about it, as it’s the only one of this species that I’ve seen. It seemed totally unfazed by me – watching me when I came on deck, but not in the least inclined to move. 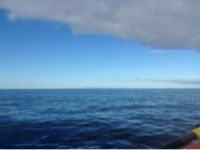 – Yesterday, as the wind fell and the waves became wide and smooth, I saw two groups of pilot whales, heading in a similar direction to each other. They came really quite close to me, and I was able to watch them all the way into the distance as I prepared myself for rowing. It felt like the sea was coming alive again yesterday, after a weekend of everything hiding out of sight or below the waves; as I was watching the pilot whales, I also saw quite a number of different birds skimming the surface of the waves. A couple of people have asked about oars – I’m still using my ‘repaired’ oar, and plan to use it all the way to Mexico. It’s heavy and a bit frustrating, but I’ve been getting used to it and its little quirks. I think of it as a friendly baby Frankenstein’s Monster – a bit bodged together but perfectly capable and eager to do its best. You may have noticed the silence and lack of any westward push over the last couple of days from me and Darien. Things have been busy here with phone calls, emails, and lots of difficult decision-making. Given the tricky conditions I have been facing since the beginning, and particularly the impossibility of making enough westward progress into headwinds, I’m much further south and further behind schedule than planned. I am being advised that, even if I do manage to punch my way westward against the wind and waves from this position, the likelihood of meeting volatile weather (tropical cyclones, hurricanes) on the way across is greatly increased both by the more southerly latitude that I’ll be rowing at and the increasing lateness of the year. I’ve thought long and hard about this, and have decided, with advice, that the most sensible decision is to alter course for a different destination. Of course I am disappointed not to be completing what I set out to do in rowing to Hawaii, but I am confident that this is the right decision, and one that does not put an end to the journey. There are many risks involved in ocean rowing, and I started in the full knowledge of these, but the balance is now tipping to those risks becoming too great. Particularly at sea, adventures don’t always work like clockwork, and it is far better to be sensitive to this and to make proactive decisions than to blindly ignore it and try to force the original plan regardless. I would rather alter course to a new route and make land under my own power now, than run the increasing risk of needing to be airlifted out later and putting my and others’ lives in danger. As it is I’m safe and well, and am continuing the adventure (and the blogs) in an easterly direction. I am planning on making landfall in Mexico, and we are working with race organisers New Ocean Wave to ensure a safe landing.Although the destination has changed, and I am no longer racing, my aims remain the same. I want to celebrate inspirational women and to raise awareness of the issue of plastic pollution in our oceans. I am still carrying out sampling for research into plastic pollution with Adventurers and Scientists for Conservation whilst I’m out here. I also continue to celebrate inspirational women. As well as all the wonderful women who have had miles dedicated to them, I have been hugely inspired by the comments and emails pouring in and am continually amazed at the stories of strength and perseverance that I hear. Please know that this has not been an easy decision to make, but I hope you agree that it is the best one, all things considered. Who knows what the coming weeks will bring?! We are sad to hear that after more than a month of battling against adverse weather conditions Elsa has decided to postpone her row to Hawaii. We commend her in making a very difficult decision and having the dedication to complete her current journey by touching land under her own power. We willcontinue to work with her and her support team until she is safely back ondry land. As always, the safety of our entrants is our primary concern and we continue to closely monitor her in case a more active and rapid response is required. Elsa has been fighting against the wind right from the start. From the challenges she faced getting out of Monterey Bay, and throughout the last five weeks at sea, Elsa has been pushing against incredibly tough conditions. 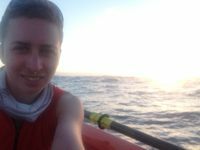 By the time she reaches her new destination Elsa will have rowed the best part of 1,000 miles entirely under her own power. According to a recent race report, Elsa has the highest ‘miles per rower’ of any of the classic-class boats. Achieving this solo, and with the last half handicapped by a damaged and repaired (and therefore much heavier) oar, is testament to her physical and mental determination. This has been an incredibly difficult decision for Elsa to make, but is undoubtedly the correct one. Elsa will continue to post updates, and would very much like to receive further words of encouragement from her supporters. Please send messages through the contact form. Elsa still has part of her core costs to cover, and will have further costs involved with recovering her and Darien from Mexico. If you’re able to support with these please consider donating oar strokes to see her safely back to dry land. Thank you to all sponsors and supporters, and people who have dedicated miles and donated oar strokes. 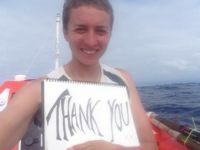 Elsa continues to row in celebration of inspirational women across the globe, and would like to thank everyone who has made her voyage possible.